The Diocese of Las Vegas [DOLV] has updated their forms for students who participate in SVS athletic activities. Please note there is one form required for EACH sport your child participates in. A new athletic form must be filled out for each activity participated in. 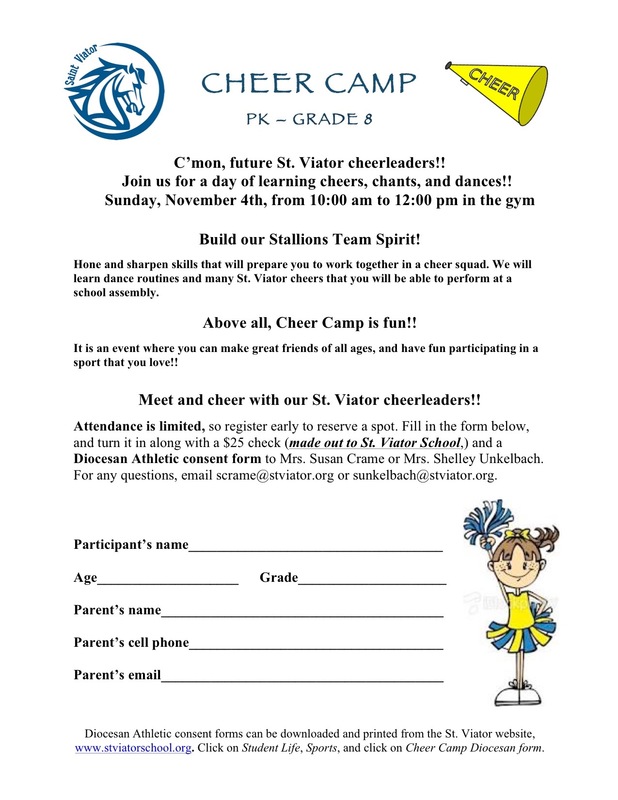 This form is the Diocesan Athletic Parent Consent Form. A link to the consent form for specific sports can be found on this page. This form must be completed within 5 days prior to any tryout or clinic, and must be turned into the Athletic Director. All students who make a team are then required to pay the appropriate athletic fee. $25.00 for soccer, softball, basketball, volleyball, and golf. $20.00 for cross country and track. Fees need to be turned in within the week after the student makes a team. Students in 1st-8th grade must wear their P.E. uniforms on the days they have physical education class. P.E. uniforms and sweats can be purchased at Dennis Uniforms. Students in grades 5th-8th grade receive points for wearing the proper P.E. uniform. Spirit shirts are not a substitute for the P.E. t-shirt. Proper athletic shoes should be worn. Any black or dark blue athletic shoe is acceptable. The students can injure themselves in Vans, flats, or Converse footwear. Athletic shoes that are any other color are not acceptable. We want your children to have a safe, fun, and enjoyable time in class. ​There is an Informational Meeting on Wednesday, March 13th from 3 pm to 3:15 pm in the SVS Library. Click anywhere on above schedule to open a printable copy.